We have a small number of horses who have come to Netherton to retire. They live in small herds of about 6 horses who stay out all year round together in large paddocks. We have around 200 acres of good grazing land to rotate them around. 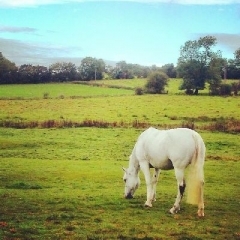 The large paddocks are ideal to give them plenty of space and good grazing and we find that they soon relax and are very content with this lifestyle. We can match horses up into a small group where they are happy and settled together. Some of are horses are older and some are here through injury and can no longer be ridden. They are checked thoroughly daily and in the winter fed hay or haylage and hard feed and rugs are checked. We charge £40 per week throughout the year. We have the facility to bring horses in if necessary or if weather contitions are extreme. We want to give the horses a happy relaxing retirement to enjoy their later years. 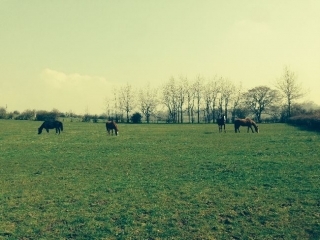 Please feel free to ring to discuss your requirements and see if your horse or pony would like to retire here. Some of our retired horses enjoying the sunshine.